My Aunt Wilma got me on the idea to create book markers as a way to sell something small at vendor fairs. And while people of all ages love what I create, I do not fair well in the monetary area. Still I will crank these out for special friends and organizations. 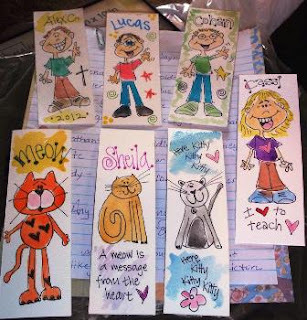 I hand draw each book marker, splash on some watercolor paint ... after they are done drying, I laminate them and cut them out. Currently, I only sell them at vendor fairs and only sell to organizations. These cuties were made in February 2012.